The Outreach ministry’s objective is to coordinate the local, national and international outreach programs in support of the Our Savior’s core value “Serving with Jesus Every Place” with our focus being part two of the churches three-fold vision “Service Adventures with the Poor and Poor in Spirit’; and to develop and support advocates who lead these programs. Outreach Ministry is funded by your general offerings but also funded by special offerings of Kingdom Expansion when a particular ministry is important to the congregation. 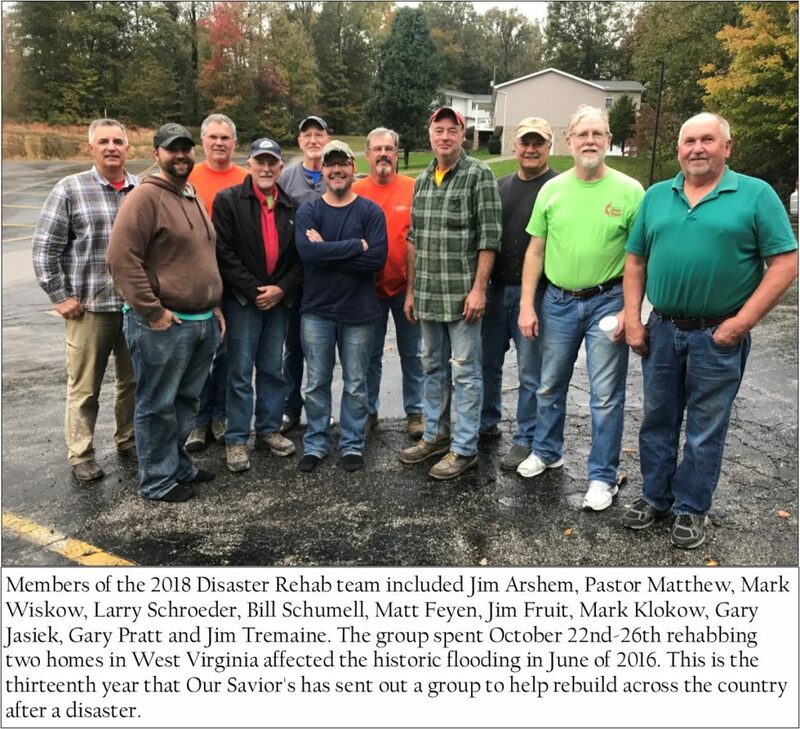 Kingdom Expansion has allowed our Outreach Ministry team to respond with funds where they are needed in a prompt manner without separate appeals to the congregation. We appreciate the generous support of this congregation to Outreach Ministry and Kingdom Expansion –Coordinators: Susan Weiss and Bill Anderson. Each month, Bread of Life, which is hosted at St. Charles Catholic Church in Hartland, provides a free evening meal for residents in Lake Country Area. Various churches and organizations prepare and serve the meal. During 2017, Our Savior’s once again participated, providing a meal prepared in our church kitchen by the Confirmation students and their mentors who also helped serve the meal on “Bread of Life” evening. About 100 meals were served and the event was a great success, enjoyed by all. If you are interested in going or would like more information, contact Gary Jasiek, 262-719-0817, gjasiek@jasieks.com. All skill levels, including none-to-low, are welcome. Family Promise of Waukesha County is part of a national organization that provides temporary housing to families with children that find themselves homeless. The reasons for their homelessness vary, but this program helps families connect with the resources they need to get back into a home of their own. A network of 13+ churches in Waukesha County are part of an organized rotation hosting the families in the evenings one week at a time, approximately four times per year. Our Savior’s has been involved from the beginning and is already into its fourth year as a host congregation. To date, we have hosted families 15 times since the program began in this area in November 2014. We currently have about 45 trained volunteers from our congregation. We also received help from our Support Congregation, Hope Lutheran Church in Oconomowoc. Many thanks go out to the wonderful members of our church who provide food, their time to prepare and serve the meals, to have fellowship with the families, and to spend the night at the church! We have a small but dedicated group who meet the third Thursday of each month in the library at church to knit or crochet prayer shawls, or hats, and scarves for local school children or the Hope Center. This year we made many prayer shawls, and numerous hats and scarves were given to those in need. We again thank Thrivent Financial for their help in buying our materials. We also knit at home but welcome anyone who loves knitting and crocheting to join our group, even if you just come for the fellowship. Donating clothes and volunteering their time at the Hope Center’s Clothing Shop! A bin is available in the Narthex area for your donations. John Weiss regularly delivers to Hope Center. Donating furniture and then distributing these items through the Hope Center’s Project Move! Preparing and serving food through the Hope Center’s Loaves & Fishes meal program. We have continued to support this ministry now for several years with financial contributions and limited volunteer support. Just One More Ministry collected (rescued) about 750,000 pounds of food in the Milwaukee area during 2017 (a 50% increase from the previous year) and redistributed it to over 60 food service programs amounting to an amazing 5,000 meals per week. Their facility is located in the Wauwatosa area. Volunteer opportunities exist for packaging meals, cooking food (like pasta, for example, that is donated but needs preparation), and assisting with food pickup from Walmart stores, Target grocery, Sendiks, etc. This organization is on a tremendous growth curve and is projected to rescue over one million pounds of food in 2018.